Scripto Sticky Notes Jr. Journal Bundle Set is an ideal office accessory. 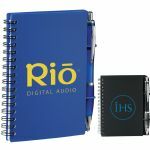 The set includes (BN6001-57) Scripto® Sticky Notes Jr. Journal with (BN6001-11) Scripto® Score Click. Includes yellow sticky notes and 5 sticky arrows. Includes 50 sheets of lined paper. Product Size : 127mm(h) x 12mm(w) x 101mm(l).